Repairs to the Hubble spaceship have been completed, with astronauts getting through perilous spacewalks to make running repairs. The fixes, which included fitting a new sensor, replacing the batteries and fitting protective covers were completed over five days. "This is a very important moment in human history," Hubble senior project scientist David Leckrone said in Houston. "We will rewrite the textbooks at least one more time." 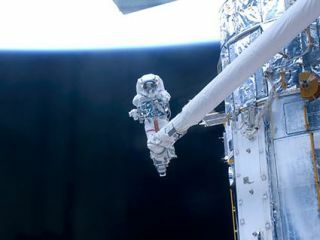 There were a total of five spacewalks for the crew, who are expected to be the last humans to touch the telescope – at least until space tourism hits the stage where people are seeking out historic space objects. The new instruments cost in excess of $220 million – but should enhance the telescope and allow it to continue gathering information about the universe. "[The mission was] a tour de force of tools and human ingenuity," added mission specialist John Grunsfeld. "On this mission in particular, the only way of finding the limits of the possible is by going beyond them into the impossible. "On this mission, we tried some things that some people said were impossible….We've achieved that, and we wish Hubble the very best."